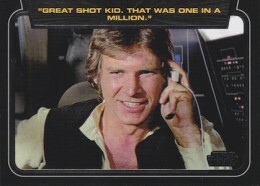 2013 Topps Star Wars Galactic Files 2 is proving to be like our own galaxy that's not so far, far away -- ever expanding. 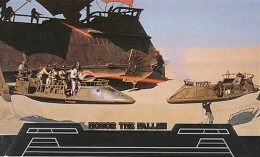 Opening up the expansive Star Wars universe even further, the large set aims to give collectors a bigger encyclopedic look at the iconic franchise. 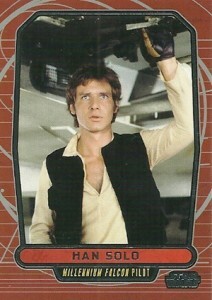 Like the first release, the 2013 Topps Star Wars Galactic Files 2 base set once again comes with 350 cards. While characters still play a major role on the checklist, the second set also has subsets for place, planets and weapons. Content comes from all six films, the Clone Wars and the Expanded Universe. Parallels include Blue (#/350), Red (#/35), Gold (#/10) and Printing Plates. 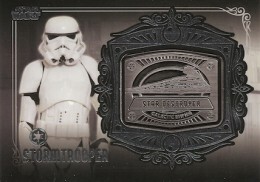 2013 Topps Star Wars Galactic Files 2 boxes come with a pair of premium inserts. Sketch cards fall one per box. Like the base set, there is plenty of variety in both artist styles and subject matter. Autographs (1:55 packs) come with 20 different signers covering the six films. Confirmed for the set are Mark Hamill (Luke Skywalker) and Billy Dee Williams (Lando Calrissian). 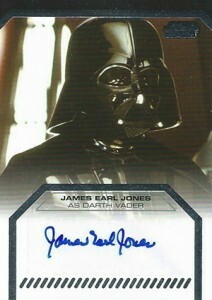 The set also has the first Star Wars Dual Autographs. Pairing lead actors, there are five cards in the set that combine for a total print run of 200 cards. New Medallion Cards (1:55 packs) take the place of the manufactured patch cards found in the first Galactic Files set. The 30-card set includes 12 different metal medallions that have 12 different vehicles on them. Every pack of 2013 Topps Star Wars Galactic Files 2 comes with one basic insert. Each of these five sets compliment the base set, adding to the release's overall depth. 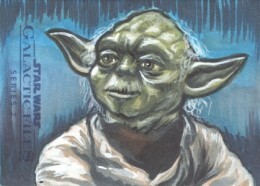 The Weak Minded (7 cards, 1:3 packs) looks at those who use the Force and how they bend others' minds. Classic Lines (ten cards, 1:4 packs) highlight some of the saga's most memorable quotes. 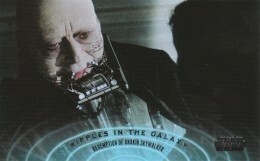 Ripples in the Galaxy (ten cards, 1:6 packs) spotlights key turning points. Star Wars has never shied away from death. Honor the Fallen (ten cards, 1:6 packs) pays tribute to heroes who succumbed to the bad guys. Finally, Galactic Moments (20 cards, 1:12 packs) uses rarely seen black and white photos. 350 cards. Shop for base sets on eBay. Click here for the complete variation guide. Click here for the complete autograph guide. 5 cards. Total print run of all stated as 200 cards combined. 30 cards. Click here for a detailed guide and gallery. WM-1 "You don't need to see his identification." WM-2 "You want to go home and rethink your life." WM-4 "You will take me to Jabba now." 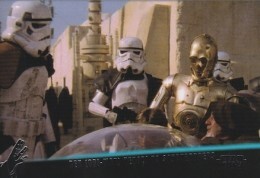 WM-5 "Then speed us on our way"
WM-6 "You will bring Captain Solo and the Wookiee to me." WM-7 "Credits will do fine."